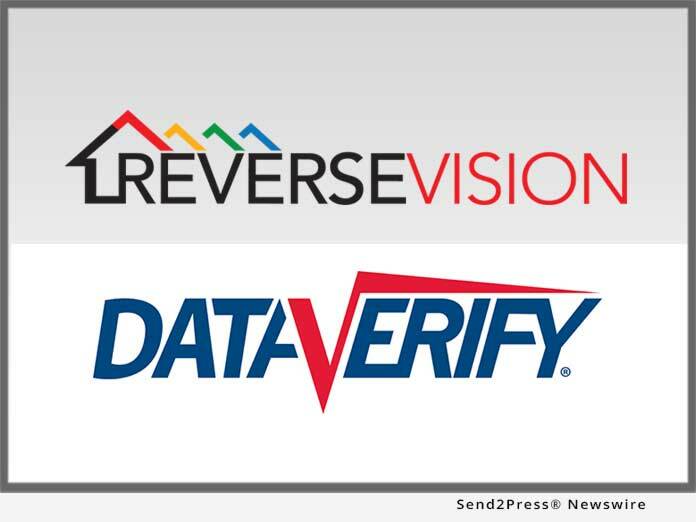 SAN DIEGO, Calif., Mar 09, 2018 (SEND2PRESS NEWSWIRE) -- ReverseVision, the leading provider of technology and training for the Home Equity Conversion Mortgage (HECM) industry, today announced the availability of DataVerify's DRIVE(R) verification platform within ReverseVision's flagship RV Exchange (RVX) loan origination system (LOS). DRIVE helps lenders improve efficiency and reduce repurchase risk by monitoring changes to borrower identity, loan application, and property data throughout the origination process. On average, mortgage loans experience 2.85 data changes between application and closing. These changes range from simple data corrections to undisclosed borrower assets and liabilities to changes in property valuation. Such data changes can not only affect borrower loan eligibility, but also frequently lead to increased loan review time, diminished loan performance, and greater repurchase risk for lenders. DRIVE, available to customers of RVX as of December 2017, streamlines the loan review process by combining multiple data integrity, fraud and compliance risk evaluations in one state-of-the-art system. The DRIVE report can include more than a dozen services, including Social Security number and 4506-T tax return verifications. DataVerify's proprietary DRIVE Score summarizes the level of risk associated with the loan, and results can be refreshed throughout the origination process for real-time monitoring of material loan data changes. "ReverseVision is committed to equipping our lender customers with top-of-the-line tools for optimizing loan quality and efficiency," said ReverseVision Vice President of Sales and Marketing Wendy Peel. "DataVerify is one of the mortgage industry's most trusted providers of data verification services, and we are proud to make its DRIVE system available to HECM lenders through RVX." "At DataVerify, we believe in the power of sound, reliable risk mitigation for lenders in all facets of the mortgage industry," said Brad Bogel, senior vice president of DataVerify. "By partnering with ReverseVision, we can provide easy to understand borrower and loan data to the reverse mortgage industry through their dynamic origination platform." To add DataVerify's DRIVE platform to RVX, please have your administrator enable the service contract for DataVerify. Note: An account with DataVerify is required to use this integration. ReverseVision, Inc. is the leading provider of technology and training for Home Equity Conversion Mortgage (HECM) origination. With nearly 10,000 active users, ReverseVision technology is used by 10 of the top-ten reverse mortgage lenders and supports more HECM transactions than all other systems combined. The company's comprehensive product suite also includes HECM sales and education tools and a dedicated professional services team. ReverseVision partners with some of the finest and fastest-growing banks, credit unions and lending organizations in the United States to provide its HECM technology to brokers, correspondents, lenders and investors. A 2017 HousingWire TECH100(TM) company, ReverseVision has also been recognized in Deloitte's Technology Fast 500(TM) listing. ReverseVision's annual user conference, the only event of its kind in the industry, brings together more than 200 lenders, vendors and educators each year to advance HECM lending. The company continues to build on its technology's pioneering capabilities with frequent enhancements aimed at boosting users' HECM volume, workflow efficiency and data analysis capabilities. DataVerify is the premier provider of risk mitigation, data validation, and decision management solutions for the mortgage industry. DataVerify harnesses advanced analytics and technology to create automated and configurable workflow and decision management solutions. Our highly responsive platform empowers lenders to make precise and consistent business decisions through an engine that identifies and measures hidden threats such as data integrity errors and misrepresentations, identity theft, and property and application risk. Engineered to offer optimal flexibility, the DataVerify platform (which incorporates 4506-T, SSA, and employment and income verification) allows lenders to manage risks according to their institution's tolerance level. For more information about DataVerify, please call 866-895-3282 ext. 5 or access the company's website at https://www.dataverify.com.